Following in the footsteps of Kanye West and Fabolous, Tyga is moving forward in the sneaker game with a new footwear line from L.A. Gear. The Compton rhymer has launched the Liquid Gold L.A. Lights collection. The sneaker is a remix of the L.A. Lights silhouette, which were popular back in the 1980s. 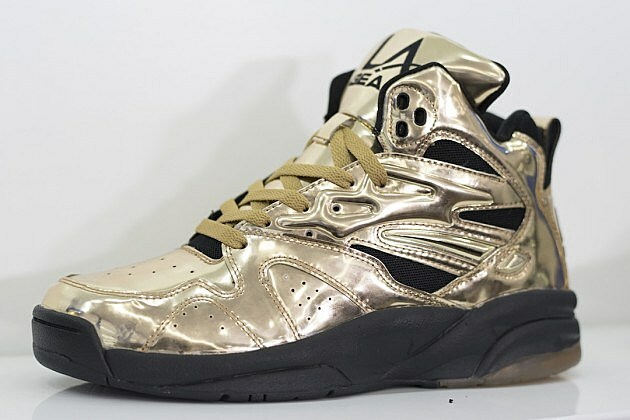 The limited-edition shoe is outfitted in a solid metallic gold upper with black accents and a black outsole. The sneaker is also decorated with lights in the heel. The L.A. Gear branding is featured prominently on the tongue as well. On Tuesday (March 31), Tyga held a sneaker release event at Shiekh Shoes in Los Angeles. Hundreds of fans and celebrities, including Christina Milian and Karrueche Tran, attended the event to show their support. The “40 Mill” rapper signed shoe boxes and took pictures with people who stood in line for hours. The Liquid Gold L.A. Lights are available exclusively at Shiekh Shoes. Unfortunately, during the event, the rhymer was served with legal papers. TMZ reports that a process server credit stood in line for more than two hours, bought two pairs of sneakers (the kicks are apparently $120), had them autographed and then gave Tyga the papers. The documents apparently have to deal with the Last Kings creator owing someone money. 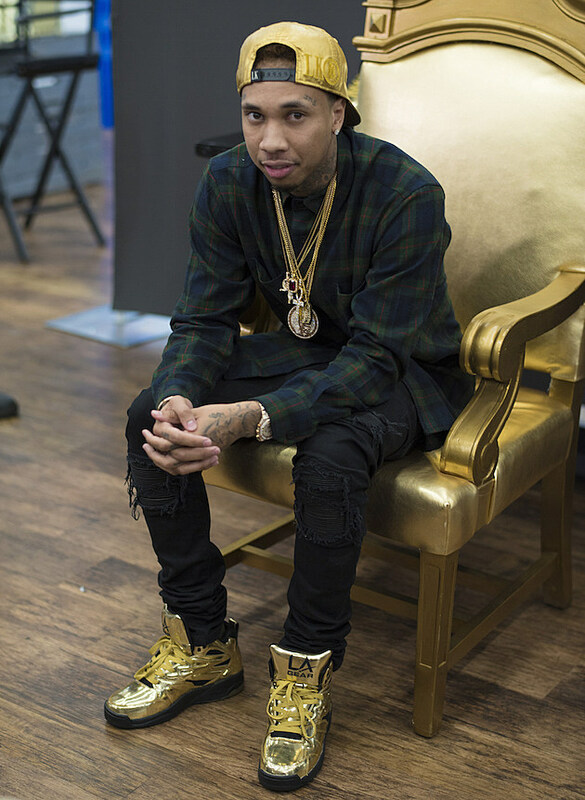 This isn’t Tyga’s first foray into the sneaker world. In 2013, the rapper teamed up with Reebok and launched the T-Raww collection, which was a line of skate-inspired kicks. What do you think of Tyga’s Liquid Gold L.A. Lights sneakers? Would you cop or drop? Let us know in the comments below.